I have been married to the same woman for nearly 23 years. Unfortunately, in today’s society this is no easy task nor is it common. I started hunting 10 years prior to marrying the light of my life. Hunting has always been on the top of my priorities, ALWAYS! When I said “I do”, it meant I wanted to spend the rest of my life with this woman. However, I also wanted to spend every chance I had for the rest of my life in God’s Creation doing what I love to do, Bow Hunt. Like bow hunting, marriage is not easy. The ongoing distractions and demands of life force you to make choices. Choices such as where and with whom you are going to spend your free time with. For the majority of my married life I have chosen to spend much, if not all of my free time in the woods. Whether it be chasing turkey in the spring, whitetail deer in the fall, or shed hunting and pre-season prep in the early to late winter months, I always seemed to be somewhere other than home. My wife would pass her feelings off as a joke to folks, referring to herself as the all too familiar term “hunting widow”. Like most hunters, I would chuckle, kiss her on the forehead and head off to the woods. It wasn’t until I had my oldest boy off to college and the younger one going soon that I started thinking about my long term future. How would life be after the kids where both gone? 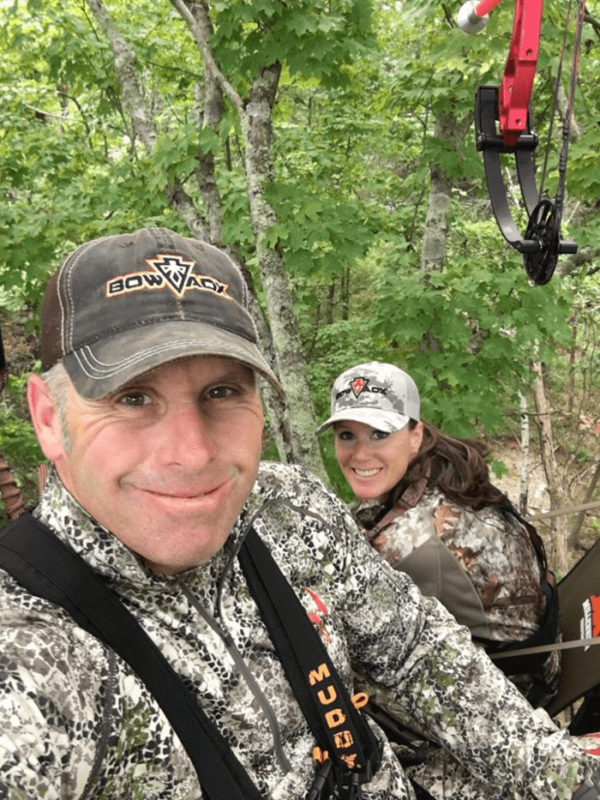 I knew the right thing to do would be to cut down on my hunting so I could spend more time with my wife. It just wasn’t fair for me to expect her to sit at home alone while I hunted; but I wasn’t sure how would I handle this. The only passion I have is hunting! My wife knew this but also knew something had to give. In May of 2016 my marriage hit a bump in the road caused by several factors. One of those factors was my diagnosis of PTSD (Post Traumatic Stress Disorder) which was ushered in as a result of my 25 years (and still going) in law enforcement. I had reached a breaking point, felt completely alone and was at a fork in the road. It was then that my wife came shining through. You see, my wife has never given up on me, should’ve, but hasn’t. Although I don’t deserve it, she treats me like her idol. I was heading out to start hanging stands this season when she said something I never thought I would hear. She said to me “are you going to hang a stand for me because I want to start hunting with you.” I stopped and looked at her and said “are you serious?” I could not believe she was serious but she was. I was so excited but there was one concern….. her fear of heights. Well guess what…. My woman will do whatever it takes to spend time with me. As she has always done, she put her fear and needs aside for my happiness. I took this opportunity and ran with it, mashed the gas pedal and haven’t let up. I purchased her a bow (pink of course) and started teaching her to shoot. She has been by side to hang stands, check feeders, and check the trail cameras. All summer long before the season began we shot together and just became inseparable. Team Sellars was born! The season was coming on fast and I couldn’t wait to take to the woods with her. Everything was on track and we were ready! Opening day was here and this is where, for me, a new challenge began. I was dressed and ready to run out the door, but I had to wait on her. I wasn’t use to waiting on anyone; this was a whole different ball game. I started to get impatient with her and had to reel it in. We finally made it to our spot and let me tell you, if you’re not used to hunting with someone, you must exercise patients. I’m used to getting to my tree and getting set up within a couple of minutes. This was no longer the case. I had to quickly and constantly remind myself that this was her first time out, she is afraid of heights, and that she is doing all of this to spend time with man she loves. She was getting out of her comfort zone to water our grass. Although we weren’t able to get it done on her first time hunting, I had the best time I have ever had with her sitting next to me in my favorite spot. Since then, we have spent many hours together, side-by-side, hunting and just enjoying each other’s company. So what is the point I’m trying to get across and what the heck does “Water your own grass mean?” Let me sum it up with this. Stop being selfish and neglecting the gifts you already have in your life. If you are a die-hard hunter and have someone in your life you love dearly, feed the relationship and watch it grow above and beyond what you could’ve ever imagined. My wife has truly become my favorite hunting partner, best friend, and my hero! PS- She got it done in the late season! I am so proud of her….